Hepatoma Res 2018;4:71.10.20517/2394-5079.2018.31© The Author(s) 2018. 1Centre for Liver and Digestive Diseases, Holy Family Hospital, Rawalpindi Medical College and Allied Hospitals, Rawalpindi 46300, Pakistan. 2Tehsil Headquarter Hospital, Murree 47150, Pakistan. Eighty million people are suffering from hepatitis C globally having six known genotypes with different distribution throughout the world. Amongst the countries with highest hepatitis prevalence, Pakistan ranks number 2, with the prevalence rate of 6.7% and the most commonly detected genotype is 3. Before the availability of direct acting antivirals (DAAs), patients were treated with interferon and ribavirin with sustained virologic response (SVR) of as low as 50% using conventional interferon and 57.6% using pegylated interefron in Pakistani population. The advent of DAAs undoubtedly revolutionized the treatment both in terms of safety and efficacy however genotype 3 is still thought to be difficult to treat genotype. After approval from FDA in 2013, sofosbuvir a NS5B inhibitor was the leading DAA followed by daclatasvir which is a NS5A inhibitor. The patent price for sofosbuvir is US$84,000 and daclatasvir is US$63,000, for a 12 week course. According to ALLY 3+ trial the combination of sofosbuvir and daclatasvir in genotype 3 patients is safe and efficacious with a SVR12 of 92% in treatment naïve and 89% in treatment experienced patients respectively. The combination has minimal drug-drug interactions and has safely been tried in patients with liver transplant, renal transplant and HIV co-infected patients as well. With Pakistan being a developing nation with a population of 29.5% living below poverty line, the price of DAAs is a major issue. With the availability of generics, a combination of sofosbuvir and daclatasvir costs as low as US$75 for a 12 week course that makes it affordable for the majority of patients in the country. Scarce data are available to determine the safety and efficacy of these low price generic drugs. Our study is one such effort to establish the efficacy and safety of these generics in Pakistani population. This open-label, non-randomized, uncontrolled study was carried out at Centre for Liver and Digestive Diseases, Holyfamily Hospital, Rawalpindi. Holyfamily Hospital is one of the largest tertiary care hospitals that drain not only local population but also patients from northern Punjab, Azad Kashmir and Khyber Pakhtunkhwa provinces. Our Centre is one of the largest gastroenterology centres of the country with well-established liver clinics. Formal approval was conducted from the ethical review board of Rawalpindi Medical University. Eligible patients from March 2016 through March 2018 who were 18 years or older having chronic hepatitis C infection with detectable polymerase chain reaction (PCR), regardless of whether they were treatment naïve or have experienced Interferon in the past were enrolled in the study. Their cirrhosis status was determined using non-invasive measures like Fibroscan, ultrasound and child class before starting therapy. A high viral load was considered if the pretreatment PCR was ≥ 8 × 105 IU whereas a low viral load was considered if PCR was < 8 × 105 IU. Patients who were of genotype other than 3, pregnant, breast feeding mothers or having active renal disease with GRF < 30 were excluded from the study. Since the patients were included through non-probability consecutive sampling technique and in addition it was a single group study, lacking any control group based on ethical grounds, hence it was a quasi-experiment study. Keeping the expected proportion of patients with attainment of SVR in Genotype 3 patients as 99% according to recent ALLY 3+ study, the absolute precision as 5% and the level of confidence as 95%, the minimally required sample size was estimated to be 16. This sample size was calculated on OpenEpi, Version 3 sample size calculator. One patient discontinued the treatment due to non-hepatic cause whereas one patient did not comply with the treatment fully due to intolerance. Treatment advised as per national consensus practice guidelines of Pakistan. Treatment Naïve or Interferon experienced non-cirrhotic patients were offered generic sofosbuvir 400 mg and daclatasvir 60 mg once daily for 12 weeks. Ribavirin 1000 mg (in patients < 75 kg) or 1,200 mg (in patients > 75 kg) was added to the regimen and the treatment extended for 24 weeks for cirrhotic patients and/or sofosbuvir experienced patients. Patients with decompensated cirrhosis if ribavirin eligible were offered a 12 week course and if ribavirin ineligible a 24 week course respectively. Patients were followed on regular intervals with PCR at 4 weeks after the start of treatment, at the end of treatment and 12 weeks after completion of treatment. All PCRs performed on Real Time PCR by TagMan Probe and sequence specific primers using Scacae Biotechnology Sa Cycler-96 instrument with a minimal threshold of 50 IU/mL used for reporting negatives. Hepatitis C virus (HCV) PCR below the threshold of quantification at 4th week of treatment is defined as a rapid virologic response (RVR), at the end of treatment as end of treatment response (ETR) and 12 weeks post treatment as SVR12. Adverse events were documented on each follow-up and patients were asked regarding fatigue, headache, nausea, insomnia, itching, anemia, weakness, rash, loss of appetite, oral ulcers, diarrhea or any other side effects. Follow-up PCRs were performed at 4th week of treatment, end of treatment and 12 weeks post treatment. All those patients were included in the study that had at least one follow-up PCR during or after the course of treatment. Before the actual data collection were written and verbal informed consent was sought from all the respondents after explaining to them the nature and purpose of study, data were collected by a standardized performa. All the data were entered and analyzed in SPSS v.22. Descriptive analytic component included frequencies and percentages of various categorical variables. A total of 102 patients were included in the study having HCV genotype 3 amongst which 63% were males and 37% were females. The mean age of participants was 48.11 years (± 12.70 years). The mean PCR HCV RNA quantitative levels were 3.5 × 106 IU/mL. The 52 (51%) patients had cirrhosis amongst which 37 (36.3%) were having decompensated liver disease. Study participants who were naïve to any previous Interferon treatment were 84 (82.4%) while amongst remaining 18 (17.6%) patients who had HCV treatment experienced previously, 3 (17%) were non-responders while 15 (83%) were relapsers. Among participants 36 had a follow up PCR at 4th week of treatment with a RVR of 86.11% (31/36). Out of 102 patients 78 patients had follow up PCR at the completion of therapy with an ETR of about 96.1%. ETR in treatment naïve was 96.92% (63/65), treatment experienced was 92.30% (12/13), cirrhotics was 95.1% (39/41) whereas in decompensated cirrhosis patients was 93.10%(27/29) respectively. Thirty patients had a follow up of 12 weeks post treatment with a SVR12 of 83.33% (25/30) amongst which treatment Naïve had a response rate of 84% (21/25), treatment experience 80% (4/5), cirrhotics 81.25% (13/16) and patients with decompensated cirrhosis had a SVR12 of 83.33% (10/12) respectively. The distribution of virological responses in study participants is displayed in Figure 1. 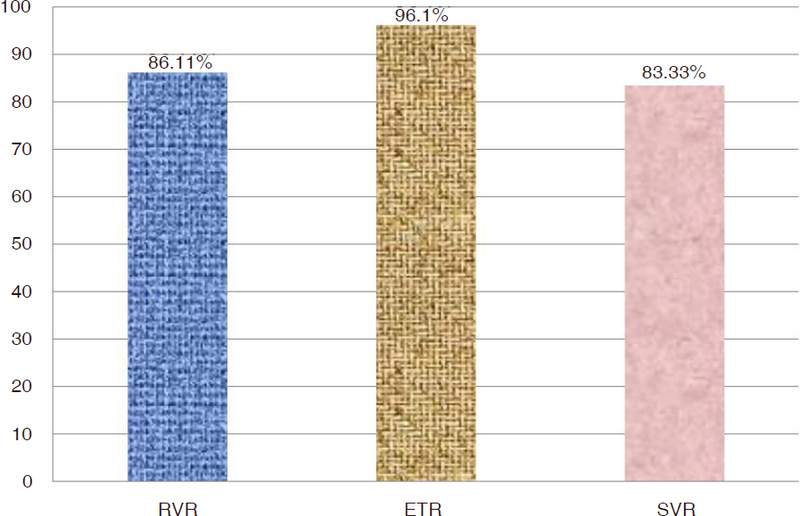 For categorical variables we applied chi-square test to explore association between the treatment status (Naïve, interferon experienced or sofosbuvir experienced) and virological response (RVR, ETR or SVR) but no statistically significant difference was observed in patients whether attained RVR, ETR or SVR 12 or not, based on previous treatment status with all P values > 0.05. Similarly no statistically significant association was observed between the baseline viral load (high ≥ 8 × 105 IU or low < 8 × 105 IU) and virological response (RVR, ETR or SVR) with all P values > 0.05. The combination was well tolerated as only 1 patient was unable to complete the treatment due to side effects. 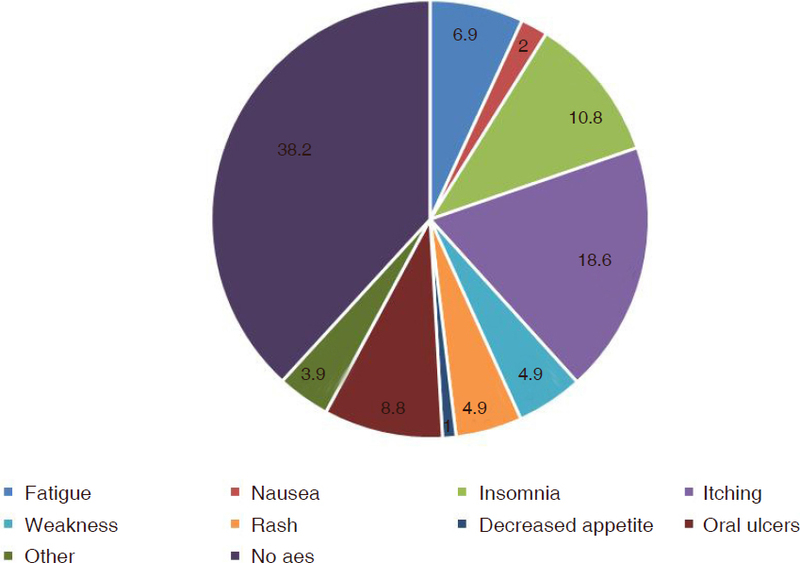 The 18.6% patients had itching, 10.8% had insomnia, 8.8% had oral ulcers, and 6.9% had fatigue whereas 4.9% had weakness and rash, 3.9% had myalgias and 1 patient complained loss of appetite. The percentage distribution of different adverse events is displayed in Figure 2. The availability of direct acting antivirals (DAAs) has really revolutionized the HCV treatment but their high prices has always been an element of criticism and efforts were being made to provide patients, especially in low income countries to get the drugs at cheap rates. Allowing generics in about 101 developing countries is one such strategy that has led to drastic decline in the prices of DAAs. But the efficacy and safety of these generics is a big concern that needs scientific evaluation. The findings of our study are reasonably good and quite comparable with the international data. ALLY 3+ one of the leading study evaluating the sofosbuvir and daclatasvir in genotype 3 patients showed a SVR12 of 90% (45/50) whereas in our study it is 83.33%. Similarly SVR12 in cirrhotics is 86% and treatment experienced is 87% which in comparison with our study are 81.25% and 80% respectively. Another study using the same combination in genotype 3 patients in a real world cohort exhibit an overall SVR12 of 88%, in treatment naïve patients 92%, treatment experienced 84%, and cirrhotics 89% respectively. A study from Iran also evaluated the results of generic sofosbuvir and daclatasvir in genotype 3 patients but their results are far superior with SVR12 of 98% (40/41). Furthermore they only include cirrhotic patients in their study and the price of generic drug is about $1,890 for a 12 week course. Our results for cirrhotic patients are 81.25% but the cost is only $75. Several factors can be responsible for this difference in results including the bioequivalence of generics as compared to the branded drugs, compliance, study population and possible underlying drug resistance. For the generics it is mandatory to prove their bioequivalence to meet WHO prequalification standards. About five different generics from Egypt and India when compared with their originator drug (sofosbuvir or daclatasvir) proved to have similar pharmacokinetics. However this difference is due to drug quality, underlying resistance or is purely epidemiological, needs further probing. The safety profile of these generic drugs is also comparable with the international data. In ALLY 3+ study fatigue and insomnia were the major side effects. In our study apart from these major side effects patient also complained of itching and oral ulcers. A study from Egypt using generic sofosbuvir and daclatasvir has described itching as side effect in up to 9.8% of the patients. Oral ulcers are not a common side effect of new DAAs. However in one of our old study regarding sofosbuvir they were present in 0.7% of the patients, but with this combination rate of oral ulcers was 8.8%. One patient developed intractable ulcers that didn’t respond to any supportive therapy and improved only after completion of treatment. Only one patient was unable to tolerate the treatment and left it after 2-3 days because of worsening decompensation. Patient was already a child class B patient with minimal ascites. After treatment patient’s ascites worsened and patient developed encephalopathy. The complications were managed medically but the treatment discontinued. This acute response can be due to some drug related liver injury (DILI) and a few case reports are available in literature describing DILI in patients using sofosbuvir. In total 6 patients were ribavirin eligible, and amongst them 2 patients developed ribavirin associated hemolysis due to which they were shifted to sofosbuvir and daclatasvir regimen and duration extended to 6 months. Both these patients successfully eradicated the virus. Out of 30 patients whose SVR were checked 5 patients were unable to eradicate the virus [Table 1]. Four out of these 5 patients were males; a finding consistent with one of our previous study based on sofosbuvir and Rabavirin. Similarly 4 out of 5 patients were treatment naïve and 1 was Interferon relapser. Our study lacks evaluation to determine the risk factors for poor outcome. Further studies should be carried out to determine the underlined genetic mutations for drug resistance as well as other factors like obesity and diabetes. Our study has less number of patients with follow-up PCR at 12 weeks post treatment to check SVR as compared to the total number of patients enrolled. This lack of follow-up is mainly due to non-compliance and affordability issues. Yet still the data are informative enough to establish the importance of generic drugs in the treatment of hepatitis C.
Overall the generic drugs are safe and efficacious. These drugs are not only cost effective but also cost saving and in the long run will help in preventing HCV related decompensated liver diseases, hepatocellular carcinomas and liver related deaths. Even for patients who are unable to respond to these drugs, new DAAs and their generics will be available in the near future. The generics for Velpatasvir are now available in Pakistan as well. The availability of new and new generic drugs will be the most effective method in eliminating Hepatitis C from the globe by 2030. In conclusions, Generic sofosbuvir and daclatasvir are cheap, safe and efficacious with a SVR12 of about 83.33% amongst genotype 3 patients. These generics will act as a pivot in the eradication of hepatitis C infection from the developing world. Departmental data, Center for Liver and Digestive diseases, Holyfamily Hospital, Rawalpindi 46300. Data sharing can be considered on personal request to the primary author. 1. Gower E, Estes C, Blach S, Shearer KR, Razavi H. Global epidemiology and genotype distribution of the hepatitis C virus infection. J Hepatol 2014;61:45-57. 2. Umar M, Khaar HT, Akhter TS, Aslam F, Ahmad SI, et al. Diagnosis, management and prevention of hepatitis C in Pakistan 2017. J Ayub Med Coll Abbottabad 2016;28:S839-82. 3. Sadler MD, Agarwal K. Treatment of genotype 3 chronic hepatitis C virus infection. Clin Med Insights Ther 2017;9:1-7. 4. Hill A, Simmons B, Gotham D, Fortunak J. Rapid reductions in prices for generic sofosbuvir and daclatasvir to treat hepatitis C. J Virus Erad 2016;2:28-31. 5. Leroy V, Angus P, Bronowicki JP, Dore GJ, Hezode C, et al. Daclatasvir, sofosbuvir, and ribavirin for hepatitis C virus genotype 3 and advanced liver disease: a randomized phase III study (ALLY-3+). Hepatology 2016;63:1430-1. 6. Gamal N, Gitto S, Andreone P. Efficacy and safety of daclatasvir in hepatitis C: an Overview. J Clin Transl Hepatol 2016;4:336-44. 7. National Assembly Secretariat (34th Session). Available from: http://www.na.gov.pk/uploads/documents/questions/1470057800_189.pdf. [Last accessed on 30 Oct 2018]. 8. Hill A, Cooke G. Hepatitis C can be cured globally, but at what cost? Science 2014;345:141-2. 9. Gilead Sciences Inc. Chronic hepatitis C treatment expansion: generic manufacturing for developing countries. 2015. Available from: http://www.gilead.com/~/media/Files/pdfs/other/HCVGenericAgreementFactSheet.pdf. [Last accessed on 30 Oct 2018]. 10. Welzel TM, Petersen J, Herzer K, Ferenci P, Gschwantler M, et al. Daclatasvir plus sofosbuvir, with or without ribavirin, achieved high sustained virological response rates in patients with HCV infection and advanced liver disease in a real-world cohort. Gut 2016;65:1861-70. 11. World Health Organization. Prequalification of medicines by WHO. Available from: http://www.who.int/mediacentre/factsheets/fs278/en/. [Last accessed on 23 Oct 2018]. 12. Hill A, Tahat L, Mohammed MK, Tayyem RF, Khwairakpam G, et al. Bioequivalent pharmacokinetics for generic and originator hepatitis C direct-acting antivirals. J Virus Erad 2018;4:e37-40. 13. Hajarizadeh B. Generic direct acting antiviral treatment: the first step towards elimination of hepatitis C in Iran. Hepat Mon 2017;17:e45788. 14. Salama H, Zekri AR, Medhat E, Zakaria Z, Shousha H, et al. Sofosbuvir plus daclatasvir with fixed versus weight adjusted dose of ribavirin for treatment of HCV, genotype 4 among Egyptian patients. EC Gastroenterology and Digestive System 2016;1:143-53. 15. Aggarwal R, Chen Q, Goel A, Seguy N, Pendse R, et al. Cost-effectiveness of hepatitisC treatment using generic direct-acting antivirals available in India. PLoS One 2017;12:e0176503.